Swiss teams are invited to participate in the 2019 Mediterranean Cricket League in Tučepi, Croatia, 23th-26th May 2019. The four-day event this year takes place at a new stunning venue located right on the Adriatic Sea with accommodation & facilities at the nearby 4-star Bluesun Hotel Alga. 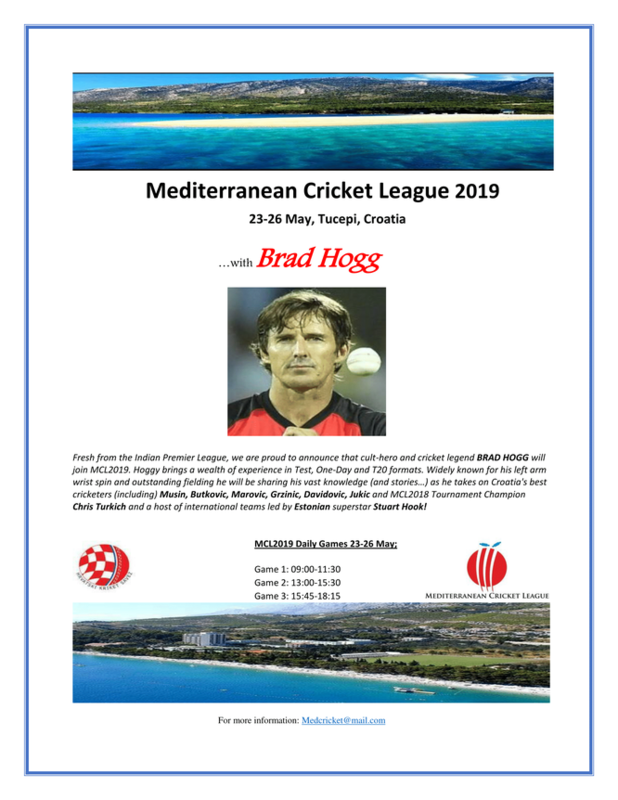 The Croatian Cricket Federation (CCF) in association with Sir Oliver Cricket Club Split (SOCCS) would like to invite you to enter a team to participate in the Mediterranean Cricket League (MCL) to be held in Tučepi, Croatia, 23- 26 May 2019. Twin share prices start from 475€ per MCL Player and 385€ per MCL Guest. MCL2019 player and guest price list is available on request. Experience playing against an international cricket legend- BRAD HOGG! Travel Insurance is encouraged for all MCL players and guests. All reasonable precautions are taken but players participate at their own risk. To confirm your team’s participation a ‘MCL Team Payment 1’ deposit of €1,500 is due NO LATER THAN January 31, 2019. Participation in MCL2019 will be allocated on a FIRST DEPOSIT PAID, first play basis so get your 1,500€ confirmation payment in as soon as possible to avoid disappointment. **PLEASE NOTE** This 1st payment is NON-REFUNDABLE as team shirts and caps will be ordered upon receipt. The remaining ‘MCL Team Payment 2’ is due NO LATER THAN Friday 29, March 2019 (amount will vary depending on player/spectator numbers, room choice and nights etc). For further information and/or to register your team contact Jeff Grzinic (MCL Tournament Director).